An annual event that honors Jujiro Wada and his legacy was held in Matsuyama. 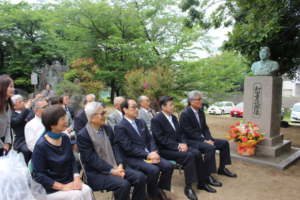 An annual event that honors Jujiro Wada and his legacy was held in front of Wada Jujiro memorial monument in Ishite River Green Park from 11 am on Wednesday, May 2, 2018. 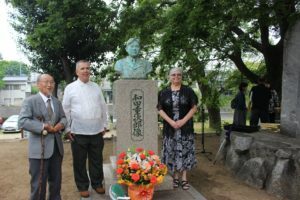 After a greeting from the president of JWMA, an award was given to the creators of the monument Hakuo Fujiwara and Toshikazu Nomoto as well as Toshio Wada. After that, in the Public hall of Hinode town, the international website of Jujiro Wada and the digest version of Jujiro Wada musical were projected. 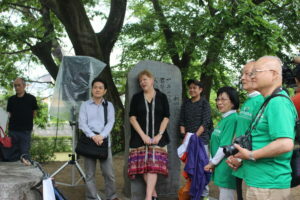 Michael O’Hare and Patti Reardon, the descendants of Jujiro Wada, visited Matsuyama City on May 1st with their friends Paula Huhges and Sonny Fel Banara. Next: Jujiro Wada is currently being exhibited at Hokkaido Museum of Northern People from July 10 to October 10, 2018.